Our aim over the last five-year period has been to increase the idea of true ‘leadership’ in our Schoenstatt community. In addition, over the past two years we have held five training days which dealt with various aspects of Fr Kentenich’s pedagogy, in particular looking at ‘Father Kentenich‘s Educational Principles applied to Leadership’ with an emphasis on trust and co-responsibility. While the majority of the training sessions were held at the National Centre in Mulgoa, near Sydney, some sessions have been repeated in Perth, Western Australia; Toowoomba, Queensland and Melbourne, Victoria so that more people are able to benefit from these endeavours. 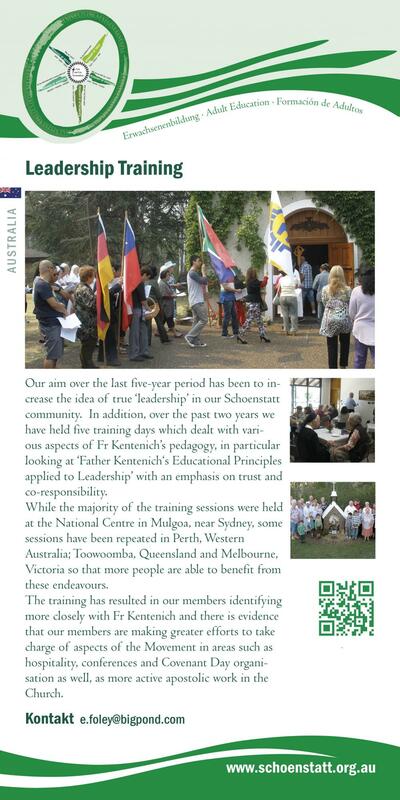 The training has resulted in our members identifying more closely with Fr Kentenich and there is evidence that our members are making greater efforts to take charge of aspects of the Movement in areas such as hospitality, conferences and Covenant Day organisation as well, as more active apostolic work in the Church.